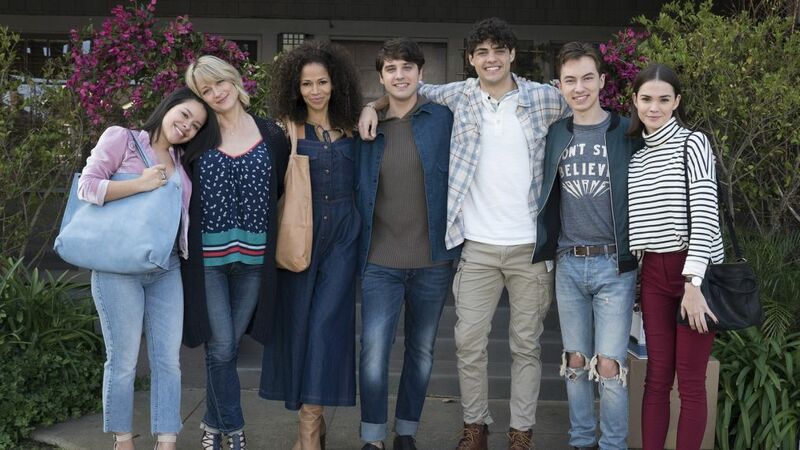 Freeform's family drama The Fosters took its final bow Wednesday, June 6, wrapping some storylines and teeing things up for the impending spinoff, Good Trouble, set to debut in 2019. It kicked off with Brandon (David Lambert) and Eliza's (Abigail Cowen) wedding in Turks & Caicos, where old feelings between the groom and Callie (Maia Mitchell) threatened the festivities of the occasion. Ultimately, the former couple parted ways amicably, but fans were treated to a nostalgic montage of some of their sweet moments. 'There’s a question if they’re going to go through with it,' says Joanna Johnson. Marianna (Cierra Ramirez) decided by episode's end that she was fine on her own, sans love interests Mat (Jordan Rodrigues) and Wyatt (Alex Saxon). Jesus (Noah Centineo) and Emma (Amanda Leighton) put the nail in the coffin of their relationship — but only after Emma made the grand gesture of traveling to Turks & Caicos to tell Jesus she loves him. Meanwhile, Stef (Teri Polo) and Lena (Sherri Saum) debated over Lena running for State Assembly, as it meant they'd have to sell their home. In the end, their kids advised Lena to follow her dream, and they packed up their house for a new start. As for Jude (Hayden Byerly), he revealed to his moms the struggles he'd been having, particularly in school. The spinoff will star Cierra Ramirez and Maia Mitchell. Fans also revisited memorable scenes between Stef and Lena, as well as those with the family in its entirety throughtout the seasons. It was a bittersweet nostalgic ride that ended on a promising note, as the characters set up where their paths were headed. Callie was seen heading to L.A., as she wanted to be closer to brother Jude. Mariana was pretty surprised by this announcement, saying, "I took the job in Silicon Valley to be closer to you San Francisco." Luckily, Callie was ready with a fix, nothing, "Well, don't you also have an offer in L.A.?" "We could be roomies," Callie offered to Mariana, setting up next year's Good Trouble. Also with Jude's close proximity to the girls, he's likely to be popping in on the new series, as well. So as fans said goodbye to one of their favorite families, the Fosters said goodbye to their beloved home. But what did the cast think about this ending? Find out below, and let us know your thoughts in the poll at the bottom. My heart is full with love, my eyes are full with tears. Family is forever. All of the characters we played are you. The Adams Fosters are you. This journey continues with you...love, teach, cry, believe, forgive, communicate. Most of all, be...be you. I’ll never be able to explain or encapsulate everything I feel today and have felt over these past 5 years. All I can say is I’m extremely proud of this show we made. Proud to know everyone involved. Proud and honored to be a part of it. Thank you everyone. And of course..... Thank you Fosters Fans for making it all so very worth it. @thefosterstv is and always will be ours.